Sr. Cecilia Hong gave a whole day retreat to Cantonese speaking parishioners of Toronto St. Agnes T.K. Chinese Church. Over 120 people participated despite the cold weather and poor heating system. The theme was on “The Face of Jesus, a Gateway to Grace”. Sr. Cecilia helped them to search the Face of Jesus in themselves and in others. She also highlighted a few unusual cases where Jesus had revealed himself to kids and different people even outside of Christianity, including a Shiite terrorist. Their conversion testimonies helped the retreatants to reflect on their own conversion. The retreat ended with the meditation of the Passion of Christ through the Way of the Cross. Fourteen couples were invited to take turn to carry the Cross. The reflection was an in-depth soul searching experience for all. An elderly man with a walker, offered to carry the Cross too with his wife, it was edifying for all. Everyone stood up to accompany him. Sr. Cecilia Hong met with the Mandarin speaking parishioners of SATCC. This was a younger group of Chinese immigrants from China Mainland. Being new Catholics, they were helped particularly to deepen their own conversion and learn how to contemplate the Face of Jesus in their own life. They were helped to learn from the Chinese martyrs who had lived a life of faith till death. They meditated on the Passion of Jesus in relation to their life and how to learn to carry their own cross and help each other carry their crosses. They felt renewed in their faith. Tonight another cold freezing night but nearly 70 people came for the Workshop on Conflict Resolution. Participants all expressed their personal experience of conflicts either with their loved ones or with outsiders. This workshop had been really helpful for each one of them as they became more aware of their own actions and reactions that caused conflicts and how they can improve their way of talking, acting and behaving from now on. They appreciated the tools that Sr. Cecilia had shared with them. Instead of two hours, the Workshop lasted for three hours as they were thirsty to find more solutions to help themselves and help others. The Workshop was deeply appreciated as it responds to everyone’s needs. This evening, Sr. Cecilia Hong was invited by the Toronto Marriage Encounter Association to give a spiritual talk on Prayer to the Praying couples. Sr. Cecilia used the Our Father as the foundation and illustrated the teachings of Christ on each verse and showing them how to pray in the light of the Bible and apply it to the reality of their life. At every verse, Sr. Cecilia led them into silent prayer and contemplation. This really helped them taste the greatness of God’s love for each one of them. It was an uplifting experience for them all! Over 20 couples participated and all expressed that it was the first time they contemplated the Our Father in depth and not just reciting the prayer. The couples also helped to promote MIC Mission News and Women without Frontier. Sr. Cecilia was invited by Fr. 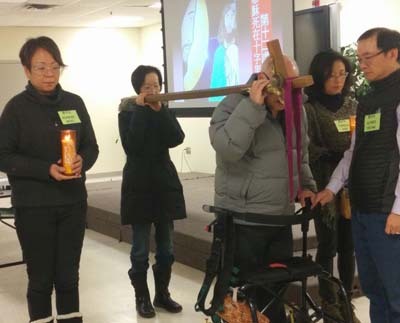 Andrew Deng CSJB to give a Lenten Retreat to Toronto Chinese Martyrs’ Catholic Church in Mandarin Since majority were newly baptized, Sr. Cecilia helped them revisit their own personal conversion and consolidate their faith. They were touched by the testimonies of different converts. Sr. Cecilia also led them into a meditation on the Passion of Christ through the Way of the Cross. They were helped to reflect on their own personal journey as Catholics. Fr. Andrew Deng ended the retreat with a special anointing of the sick which everyone was happy to receive this sacrament. 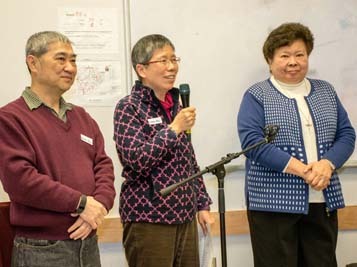 This afternoon, Sr. Cecilia gave the same retreat to 80 Cantonese speaking parishioners of CMCC. Their eagerness for spiritual nourishment was edifying. Since the Parish bears the name of Chinese Martyrs, Sr. Cecilia emphasized particularly the persecution of the Chinese Catholics during different periods where significant people were tortured for their unwavering faith. Linking these martyrs to the persecuted Catholics today, Sr. Cecilia invited the retreatants to pray for millions of Catholic refugees of Syria and Iraq whose homes were destroyed by ISIS. This awareness helped them experience a vivid Passion of Christ today when they took turn to carry the Cross. It was edifying to see a lady who had broken ribs courageously offered to carry the Cross too! Throughout these 6 days of retreats etc., the Toronto Past Students of Good Hope and Tak Oi were excellent collaborators who assisted Sr. Cecilia in promoting MIC Mission News and making Venerable Delia known. Tonight Sr. Cecilia met with the new Superior General Fr. Francis Chong, CDD who was the former Pastor of St. Agnes T. Kauying Church and the newly named Pastor Fr. Thomas Loh, CDD who was the former Assistant pastor. The two priests expressed their desire that Sr. Cecilia will continues to support them in the coming year. Fr. Chong will leave for Taiwan in June after their 25th Anniversary of St. Agnes Church. 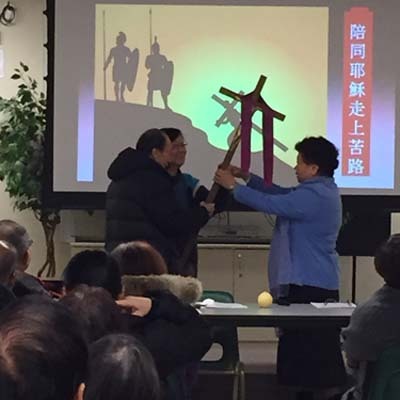 Leaving Toronto, Sr. Cecilia proceeded to Ottawa to give more retreats to Ottawa Chinese Shen Sheng Catholic Church (SSCC). She gave a Lenten reflection in Mandarin on Reconciliation. It was a half day Adoration and prayer. Sr. Cecilia helped the retreatants to reflect on the Passion of Christ and their own need to reconcile with God, self and others. This was followed by the Sacrament of Reconciliation. Over 50 parishioners came for the service. The recollection ended with a friendly re-creative evening for community bonding. Today after Mass, Sr. Cecilia continued to give the Ottawa SSCC community the Lenten Retreat in Cantonese. Around 40 parishioners attended. They were helped to recognize the Face of Jesus not only in Saints but also in virtuous people around them and among them. Several of them felt privileged to have met St. Pope John Paul II and St. Teresa of Calcutta. This experience made them feel that Jesus lives among them and leaves His Holy presence in saintly people. They were especially touched by the presentation of Sr. Cecilia where she shared about the conversion of many people today who testified for having been healed and forgiven by Jesus.